Steiff Bear on Wheels Replica 1904 Discounts Apply ! Made from The Finest Brown Alpaca . 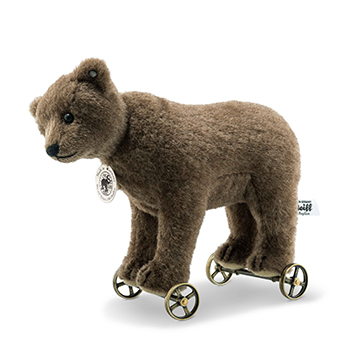 Fun on the move … Particularly before jointed bears arrived on the scene, Steiff animals on wheels were all the rage. This bear on wheels was produced as early as 1894 in sizes up to 100 cm. Our 17 cm replica corresponds to the 1904 version with a frame and the first “Button in Ear” – an elephant button without a tag. The bear whizzes through the world of his Steiff friends, his wooden eyes shining merrily. 1-way jointed (head) with Glass Eyes and stuffed with Wood Shaving filling, and with featuring elephant motif made of patinated steel "Button in Ear" and Surface Washable. This Piece is part of Steiff's 2018 Exclusive range. Free Steiff presentation box and numbered limited edition certificate of authenticity.